Not only the coat has to be taken care of | Rocky's Pet Care - We love pets! Not only a proper coat care, with regular brushing is the job of a loving and attentive dog owner. Also important is the regular monitoring and care of eyes, ears, teeth, claws and genital area. Almost every dog ​​from time to time have problems with their ears and eyes. In most cases, inflammation is the reason that can cause big problems if left untreated. If the dog is strangely scratching its ears and shaking its head, you should be vigilant. If you ignore the problem, it can have serious consequences therefore prevention is the most important remedy. Cleaning dogs and cats ears. Excessive care can damage as well as underestimate the problem. It is typical that people clean the ears of their pets with cotton buds which is not recommended as they push dirt even deeper into the ear leading to inflammation. The ear canals of dogs and cats are shaped differently than in humans so inflicting a wound during cleaning is almost impossible however, it is still necessary to take care! Much gentler is the use of ear drops that clean the ear perfectly and at the same time act as a prevention of ear infections. We work here with Karlies Ear Care. A natural and gentle solution to eliminate blemishes from the ears and to protect the hearing of dogs and cats. Around the ear cavity it works as a disinfectant, hydrating and preventing infections, inside the ear, it dissolves dead skin and earwax. It is enough when the drops are applied directly into the ear, massaged in and finally wiped with a clean cloth. You should also take care of the areas around the eyes of dogs and cats. Regularly check your eyes for tearing and eliminate even the smallest clumps immediately. In dogs and cats, dirt may form in the corners of the eyes and needs to be removed. Not eliminating dirt in and around the eyes can cause problems because it can stick to the eyes and surrounding fur. For cleaning we recommend Karlies eye wipes which come in a practical dispenser and gently care for the eyes and surrounding area. Also available is Karlies Tear Stain Remover, this must only be used outside of the eyes and helps to eliminate the discolouration caused by bacteria in the tear fluid. If your dog has a long coat, the coat should be cut regularly so that the overgrown hair does not interfere with the eyes. The eye care of dogs and cats helps prevent various inflammations and discharge. If they should occur regularly and are not easily removed, do not hesitate to drive your dog to the vet immediately. Ancestors of our domestic dogs did not have problems with dental care, their teeth would be cleaned when tearing and eating prey. Today’s dog food is no longer suitable for this and that is why it is even more important to actively intervene as a dog owner. Regular dental checks should therefore be as natural in dogs as they are in humans. Because dental diseases in dogs are more common as one suspects they also have worsening consequences. Dog’s teeth are threatened by the same dangers as our teeth and are not immune to tartar, periodontitis and tooth decay. Tartar is common and causes unpleasant halitosis as well as painful inflammation of gums. The rough surface of tartar allows sticky leftovers to adhere and serves as food for bacteria in the mouth. These bacteria multiply explosively and form deposits on the tooth surface (plaque). These bacteria sooner or later lead to inflammation of the gums and as a result of which gums retract forming pockets and the sensitive tooth necks are exposed – paradontosis has developed. Without treatment, the condition worsens until the tooth roots are exposed. In worst cases, even the jawbone can be attacked and at this stage, the tooth is beyond saving. In addition, the periodontal pockets in tartar and dental plaque, bacteria can enter the body via the blood vessels and cause disease. In particular, changes and problems in the heart, kidneys, skin and joints can be the consequences. Brushing teeth is by far the most effective dental treatment for combating dental plaque and thus preventing tartar, paradontosis and tooth decay. For this purpose, it is recommended to brush the dog’s teeth daily. By brushing the teeth plaque is removed from the tooth surfaces and from the periodontal pockets before it mineralizes and turns into tartar. This can be in the form of a special dog toothbrush or a fingerstall with canine toothpaste or using Karlie Tooth Wipes. These moist wipes are in a practical dispenser, with baking powder, cetylpyridinium chloride and the mint flavor simplify the process enormously. If the process of calculus formation has progressed too far, we at ROCKY`S DOG LOUNGE offer scaler removal by ultrasound. The ultrasound dissolves the calculus and can then be removed with the help of a scraper – without anesthesia! Again, care should be taken to ensure good hygiene. Adhesions after urinating and also remnants of the “big shop” can be removed well with the moist care cloths of Karlie. 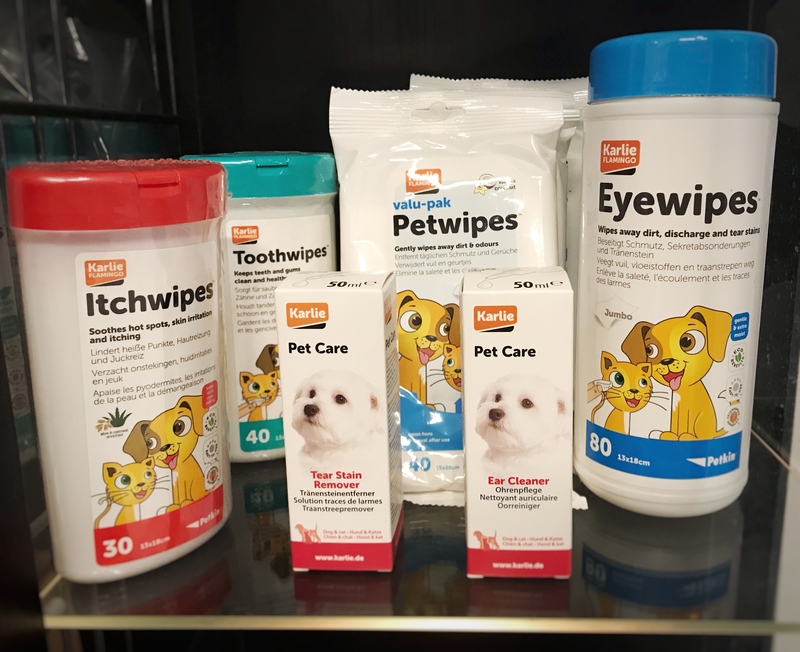 The Karlie “Itch” wipes provide an easy way to relieve itching and discomfort caused by hot spots, flea bites and skin irritation. Cool and soothing formula relieves itching and pain on contact to reduce your pet’s scratching, licking and chewing. A bitter taste prevents the dog from licking further. The wipes contain witch hazel, aloe vera gel, comfrey and vitamins for cooling, plus lidocaine to stop itching and pain. You´ll find all products in our Shop.